Ok so I just bought my first honda prelude and now I am having alternator issues I bought a manual but it isnt much help. Anyone have any ideas that could help me out on removing this thing? Re: 85 1.8L alternator removal!?!?!?!? did you get the honda shop manual for your car or just the chiltons? 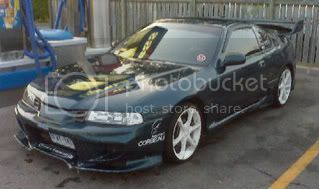 1993 Prelude 2.2 v-tec h22a1, Eibach adjustable coilovers, 18" rims wrapped in Falcon 35 series tires, Invader body kit, polished and ported head, catback, wrapped headers, coldair, short shifter, Mugen CF 320mm steering wheel, strut bar, double deck wing, crossdrilled rotors, etc. JDM LSD TRANS. Carbon fibre hood sprayed with black Candy clearcoat...sic!!!!! we have removed all of the hoses in the way and unbolted the alternator from the motor and now it is just sitting there. We cant seem to pull it out though because it wont fit. we have tried pulling the carburetor and see if it will come out that way but needless to say that didn't work either. would it just be easier to pull the motor? I am at a complete loss we workied on it for about 4 hrs or more yesterday. When my alternator went out, we were able to wiggle it out where the air filter was. Did you loosen the belt and everything?